One of Colombia's most wanted drug dealers, Henry de Jesus Lopez, has been arrested in Argentina. 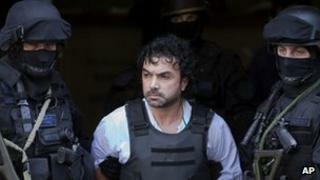 Lopez, known as Mi Sangre or My Blood, was detained while eating in a Buenos Aires restaurant, police said. He is alleged to be the leader of the Urabenos gang, which controls much of the drug trade in northern Colombia. Colombian President Juan Manuel Santos has made the fight against criminal gangs such as the Urabenos one of his government's priorities. President Santos, via his Twitter account, thanked the Argentine authorities for their co-operation in finding and arresting Lopez. "Another blow against the Bacrim (criminal bands) and drug-trafficking," Mr Santos wrote. Lopez, 41, a former right-wing paramilitary fighter, is reported to have posed as a businessman who travelled frequently in South America. Police said he held passports from seven countries to evade capture. He had escaped two previous operations to catch him in Argentina and Paraguay, said Gen Jose Roberto Leon Riano, the head of Colombia's police. Officers from the United States Drug Enforcement Administration, the Colombian police and the Argentina police force had been tracing him for months, tapping his phone, tracking his cars via satellite and infiltrating his inner circle. They said he, his wife, two children and 10 bodyguards had constantly moved between five different residences. According to police, Mi Sangre had arrived in Argentina two years ago, but had travelled between Venezuela, Uruguay, Ecuador, Mexico and Paraguay arranging drug deals. They said that only minutes before his arrest he had met a member of the Mexican drug cartel Los Zetas, for whom he provided much of the drugs. He is wanted both in Colombia and the US.